I have been happily scrapping with my new kit. 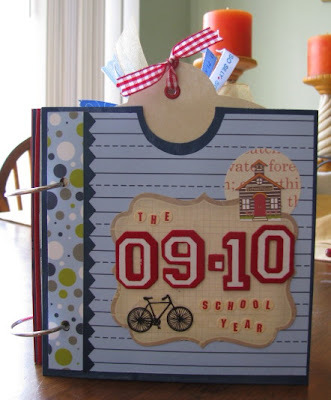 Yesterday I noticed there was even a Back To School challenge on the Noel Mignon Challenge Blog. For this challenge, I completed a simple page made into a folder to hold certificates and awards for Blake's album. Everything on this page is from the Core Curriculum kit except for the Thickers. A Melissa Frances tag/envelope booklet was included with my kit. I loved it, but wasn't sure what to do with it until I saw this project on the Noel Mignon Layouts and Projects blog. Wow! The first three envelopes were shown on the blog and I pretty much lifted the cover and October pages exactly. I have the same general LO for September, but used the book page for my background. For the other pages, I just tried to be creative. 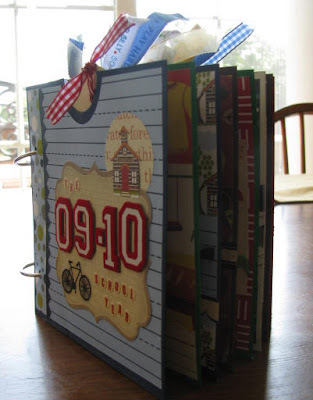 All of the papers and most of the embellishments were included in the kit. I had to add ribbon and misc. embellishments here and there. I also got some good use out of alphabet stash. I also decided to paint the envelopes before I covered them with paper. 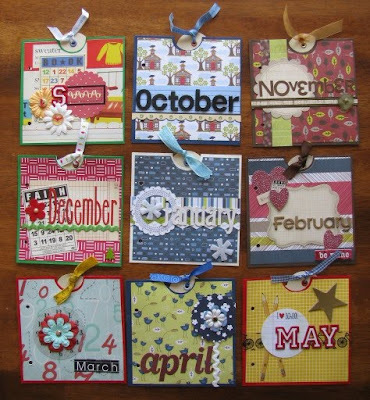 I loved Noel's idea to use the tags throughout the year with a photo on one side and journaling on the other. With two boys in school though, I may use smaller photos and dedicate one side of each tag to one of my boys to document the hightlights of their school year. I'm really happy with my new projects! Amy, Amy, Amy!! LOVE all of these projects. The folder page is ingenious! 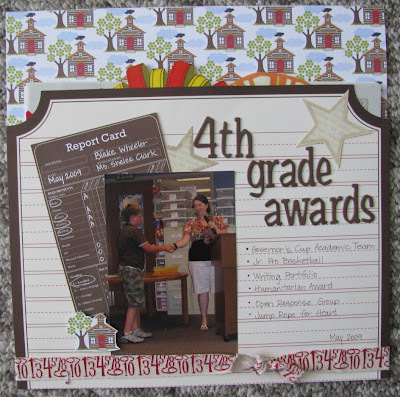 And I love the tag album--what a great idea to have around for the school year. You are so awesome! I think it is such a great idea and I know you, of all people, will keep up on it. And at the end of the year, you will have such a great little collection of memories. I wonder if I could actually do something like this... Hmm... :) Thanks for the inspiration! that mini looks great! I love that idea! Soooo...You got hooked on the Noel Mignon kits as well. I love them too...but only buy a kit now and then. Beautiful work Amy. those are all beautiful! love the papers used on the school page!